Using genetic particles known as small interfering RNAs (siRNAs), scientists have halted the replication process of the deadly Ebola virus in monkeys; a breakthrough that the researchers say should be reproducible in humans. 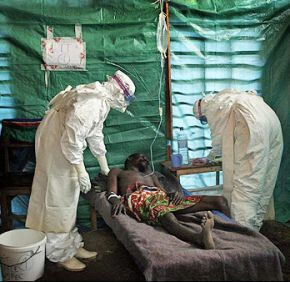 The Ebola virus causes hemorrhagic fever with fatality rates as high as 80 percent in humans. The virus can be transmitted through the air although it is more commonly spread through blood and bodily fluids. Until now there have been no available vaccines or therapies. Reporting their work in The Lancet, the researchers explain how RNA inhibitors were used to target a protein – called the L protein – that is essential for Ebola virus replication. RNA inhibitors are based on a natural gene silencing mechanism used by all cells, and lipid nanoparticles are the most widely used siRNA delivery approaches. In this study, the team used a proprietary technology called SNALP, or stable nucleic acid-lipid particles, to deliver the therapeutics to disease sites in animals infected with the Zaire strain of Ebola virus. A group of three rhesus macaques was given anti-Ebola siRNAs intravenously, 30 minutes after exposure to the virus, and again on days 1, 3, and 5. A second group of four macaques was given the treatment after 30 minutes, and on days 1, 2, 3, 4, 5, and 6, after exposure. Two of the three animals in the first group (which received four post-exposure treatments) were protected from lethal infection and survived. All four of the monkeys given seven post-exposure treatments were protected. The treatment regimen in the second study was well tolerated, with minor changes in liver enzymes that might have been related to viral infection. The study represents the first demonstration of complete protection against a lethal human infectious disease in nonhuman primates using RNAi, according to study leader Dr. Thomas W. Geisbert of the Boston University School of Medicine. “We believe this work justifies the immediate development of Ebola SNALP as a countermeasure to treat Ebola infected patients, either in outbreaks or accidental laboratory exposures,” he said. The researchers say that further studies in monkeys will be necessary to refine dosing, toxicology and other issues before the treatment could be licensed for human use.